Because of its generally stormy and rainy weather, Hamburg is a surprising location for a vineyard. 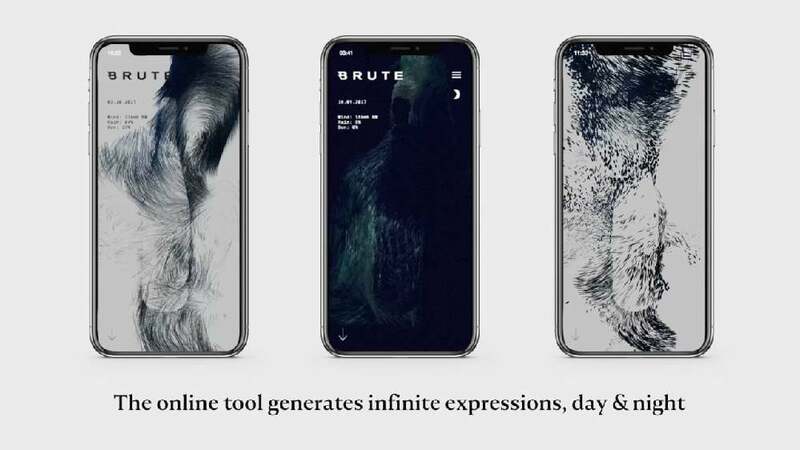 This is precisely the tack taken by Brute’s brand identity, with key visuals based on Hamburg’s weather data: in order to create a fully weather-powered brand experience, an online algorithm was built which captures the weather in Hamburg and generates an evolving expression reflecting the conditions in real time. The algorithm captures data throughout the growing season and generates packaging which expresses the brutal conditions which craft each vintage. So, as the wine evolves with the climate, the brand evolves as well. In addition, the empty bottles were stored out in the vines during the summer to get weathered.